Been working with a line-up of the Zepplin, the Cogblade Raptor and a Pygmy Direhorn (since she doesn’t take as much damage from Crush). So far, it’s been pretty reliable. Amazing strat that I learned from… somewhere.. I think wowhead maybe? Use a Water Waveling (Any level/rarity really), and two foxes. Use the geyser ability.. Oon will pull one of your foxes in after frill blast.. Use the Howl ability then Flurry. The Howl will affect the geyser in addition to flurry. Makes quick work of him. Might take one or two tries but probably better if you use all rare level 25s. This sounds like a modified howl bomb strat. It seems like most strats are following one of 2 lines… either zerg her down with mechs, or do the howl bomb thing. I’ve been working on a carry strat for this, but at this point it’s only worked on Magic pets, because Magic family 35% thing. lol. I’ve had success with a Skywisp Moth, Clockwork Gnome and a Zandalari Kneebiter. Start with a cocoon to avoid the first hit. Follow up with a thunderstorm and switch the Clockwork Gnome in. Build the first turret and then die. Switch the Kneebiter in and apply black claw. If you’re still alive the next turn, throw down a hunting party. Once the moth is forced back in due to death, cocoon again. Follow up with slicing winds which should be enough for victory. I’m just sticking with the same team I use for Kafi, the Fabled Goat. Darkmoon Tonk (a stun from Shock and Awe helps – let’s you set and use a Lock and Load). 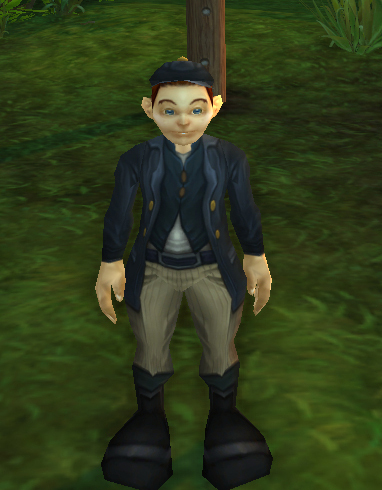 Tonk is then swapped in for my Clockwork Gnome, who turrets and punches til dead. Back to Tonk for more Shock and Awe/Missile, then Personal World Destroyer (he was just chosen for his high damage against Kafi). 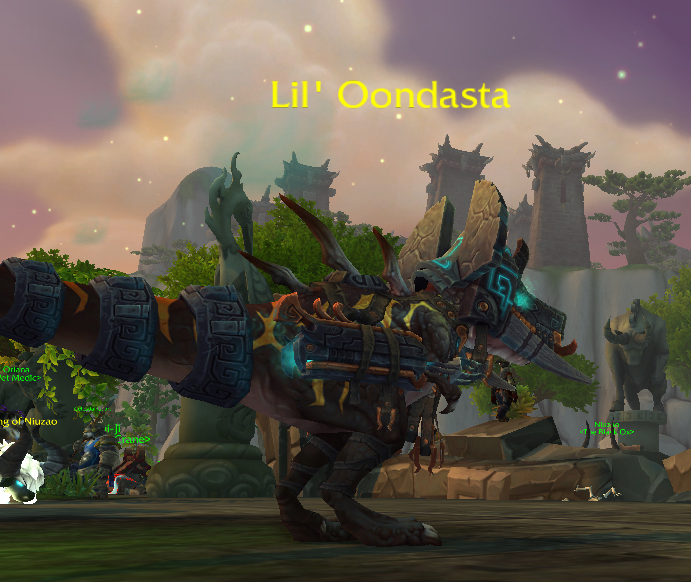 This team usually one or two shots Lil’ Oondasta. Straight mech burn. I use a Tranquil Mechanical Yeti and a Darkmoon Zeppelin exactly like you with a little twist. I wait until I get Failsafe to activate or after the second spirit fire beam to drop the Decoy. What happens is that I can use Explode in the same turn he use Frill Blast and doing so make me pick my the next pet: the yeti. Ion Cannon again usually kills him. Once, I levelled a level 1 Netherspace Abyssal using the zeppeling and the dragonling with explode. I think that only magic pet could be levelled since pet must survive 2 shots of SpiritFire beam. It is a pleasure to read your blog! I use a mechanical squirrel and a tonk, backed up by anything mechanical – the last pet rarely even needs to swap in. Usually goes: squirrel uses Rabid, Oon swaps tonk in; tonk uses Shock and Awe, sometimes gets a lucky stun but usually gets horribly mangled; missile until res round, then Ion Cannon, which should land while Rabid is still up. Switch squirrel back in and Metal Fist to death. Works well because Frill Blast is magical, and the debuff on early rounds sets up the tonk’s big hits. Never lost using this combo. okay could we have a lil help in the facts of what pets NOT INCLUDING DARKMOON OR UNOBTAINABLES that we can use against these guys? I’m not sure what you mean by unobtainable. The reason I went with this selection is because the dragonling is a tradeable engineer pet, which looks to be available at under 1Kg on most realms. 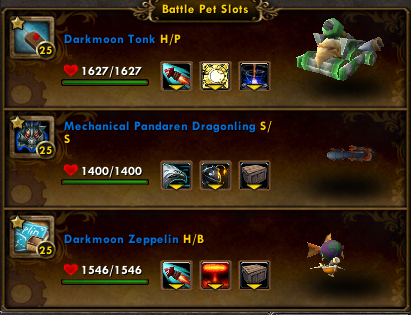 The Darkmoon pets are all around 3Kg on the AH on most realms, and have been available for a couple years. So, I’m going to make some suggestions and hopefully some of this will be obtainable for you. I don’t make any promises as to absolute replication for the strat, though. You could definitely swap the Menagerie Custodian for the Tonk, but that’s ~1Kg too, if slightly more soloable to obtain initially. A Tranquil Mechanical Yeti & either Lil Bling or Clockwork Gnome combo could work pretty well, but the Yeti is even more expensive and engineer-made. I made a point to avoid Blingtron in the strat because he’s new, and the Clockwork Gnome is even more expensive than the Darkmoon pets but obtainable via dwarven archaeology combines. You could also add in a buff pet, like a raptor with Exposed Wounds (obtainable via quest, vendor, AH or the Cogblade Raptor, which is a rare tame) or preferably a Zandalari raptor (~1K on most realms) with Black Claw in place of the Custodian/Tonk. I’ve seen others using a Howl Bomb team, but I had hit or miss results with one. You have to use a Pandaren Water Spirit in the middle, which is expensive but obtained by doing the Flowing pet battle daily. You can supplement with Lost of Lordaeron at the beginning for a Curse of Doom and end it up with a caught fox with Howl from Kun Lai. But like I said, this has been hit or miss for me, so I didn’t recommend it. It’s worse than that; Darkmoon pets are cheap in terms of tickets, and can be bought with a month’s worth of prof quests and a couple of cheap dungeon item turn-ins. The tonk and zeppelin are far from out of reach. Surprised they’ll sell for that much on any server. A rabid nut-varmint 5000 can be caught in any number of areas starting from Azshara at the lowest, and works quite nicely.